You may not know it, but a change is coming. Soon we Americans are going to breathe a collective sigh of relief and wonder to ourselves, “what the hell were we thinking?”. The healthcare industry as we know it is seriously fucked up. It is not going to change over night, but with the help of one small company it just may be changed from this point on. Enter change:healthcare. change:healthcare has one mission… To provide consumers with the tools, services and information they need to make the best healthcare decisions possible. Period. Did you take a minute to read the words in the image above and grasp how awful this is? With the amount of money, time, energy, frustration and confusion that exists within the healthcare system, hardworking people like you and I have previously been left out of the conversation. We have been left to fend for ourselves and to find our own information in order to make intelligent decisions about how we spend our money in regard to health related expenses. Do yourself a favor: visit this page and learn about the change that IS coming. 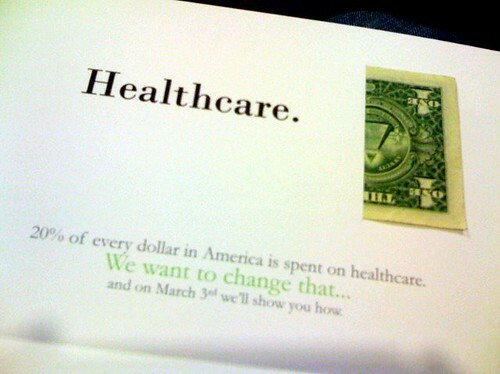 Starting March 3, 2008, you too will be able to change healthcare.